Photograph B-2346 by Leonard A. Hillyard courtesy Saskatoon Public Library- Local History Room. 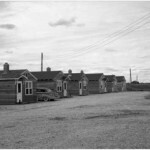 In the 1940s, the provincial government was looking for ways to revive the tourism in Saskatchewan after the Second World War. In 1946, the provincial government sponsored a conference that focused on establishing tourist camps and regional parks. 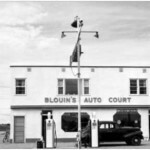 At this time, Saskatoon created a “Tourist Court” zoning classification and amended several bylaws to allow for gas stations, restaurants, and stores to operate in conjunction with one another. These establishments were also able to be open for extended hours in order to accommodate the travelling public. Although City Council agreed that Saskatoon was in need of a tourist court, the City refused to operate it themselves. 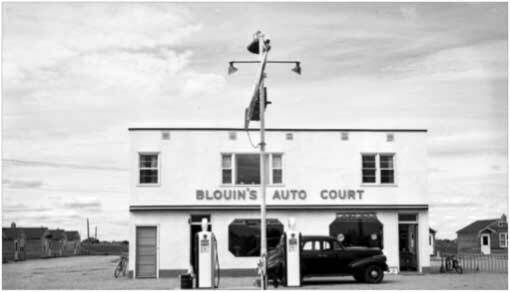 In the 1940s, a number of private facilities were established, including George Blouin’s Auto Court located at 1301 8th Street East. The Auto Court opened in 1948. The City sold the site to George Blouin and also set up power lines, and water and sewer mains. 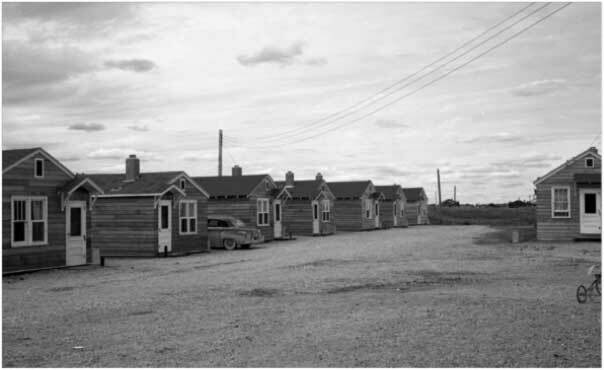 The Auto Court had a ring of small, winterized cabins next to a building that contained bathrooms, showers, a store, a lunch counter, and a gas station. By the summer of 1949, the court had 15 numbered cabins and a dozen electrified trailer sites. This site has since been the Colonial Motor Court (1952-1957), Colonial Courts Motel (1957-1989), and the Colonial Inn and Suites (1989-present). – City Archivist, Jeff O’Brien. – Henderson’s Saskatoon Directory, 1949-1989. Photograph B-2344 by Leonard A. Hillyard courtesy Saskatoon Public Library- Local History Room.